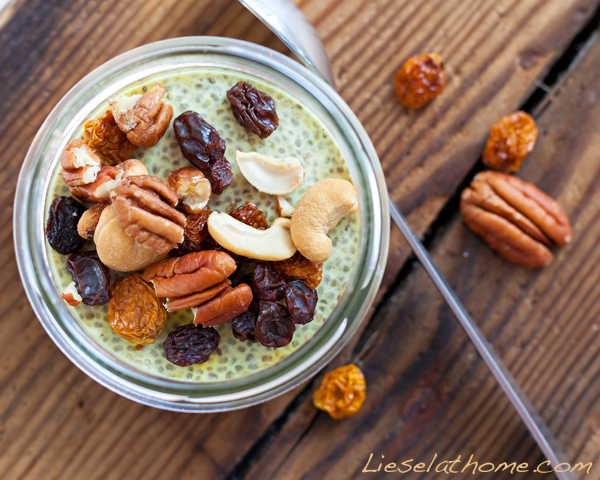 Chia puddings has kind of become a trend lately and recipes keep popping up everywhere for vanilla chia pudding and chocolate chia pudding. Both are awesome I make them regularly, but I felt it was time for something new. 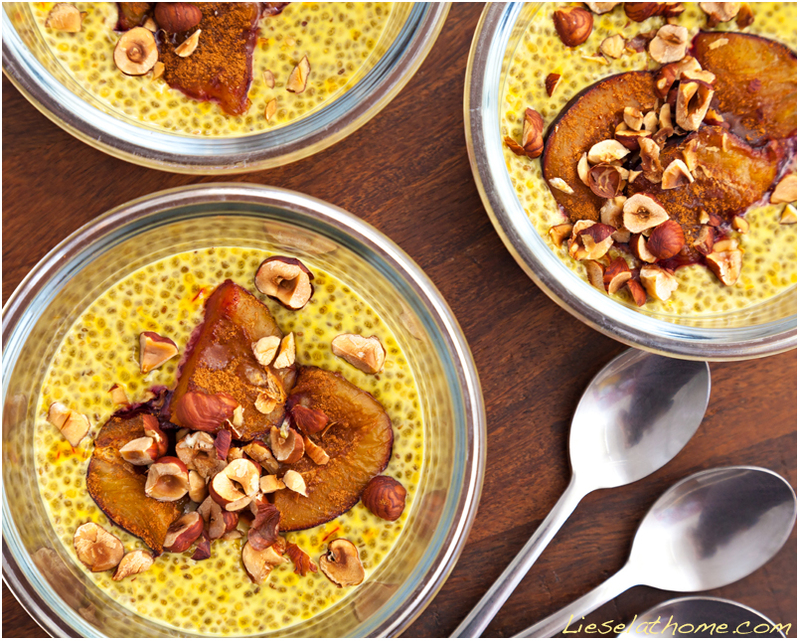 I had a new friend over for lunch last week and inspired by her warm and sunny personality I came up with this saffron pudding with a hint of cardamon. She loved it! Here’s to new friends! To the warm and sunny people in our lives! Maybe you’ve already tried making my recipe for vanilla chia pudding? This is just as easy and we’ll follow that recipe closely. We need coconut milk as a base and it takes only a few minutes to make your own – plus it tastes better and costs less. Win – win situation! You’ll find an instruction HERE and also HERE. Only – for this recipe – I take 250 ml shredded coconut and 850 ml warm water – this gives me 800 ml lovely homemade coconut milk! Slowly heat up and stir every now and then. No need to boil it – we just want it warm. 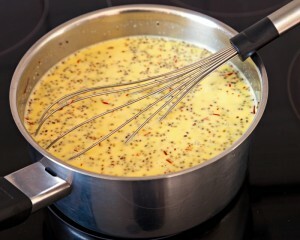 The heat will help the saffron to give taste and color. Once warm – remove from heat and let the chia seeds swell for about 25-30 minutes. Just stir every now and then. Then divide into bowls, glasses, jars or whatever you find suitable. Serve slightly warm or cold which every you prefer. 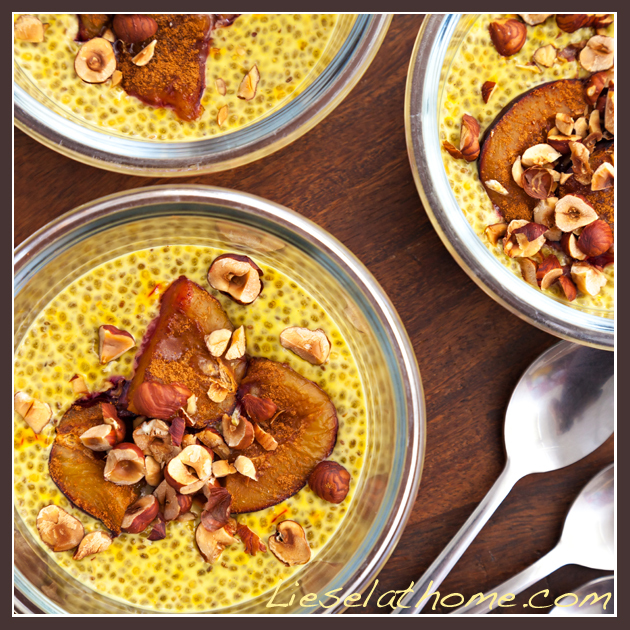 Above, the saffron chia pudding slightly warm, with oven baked cinnamon prunes and roasted hazelnuts. Very much recommended! This is comfort food at it’s best! 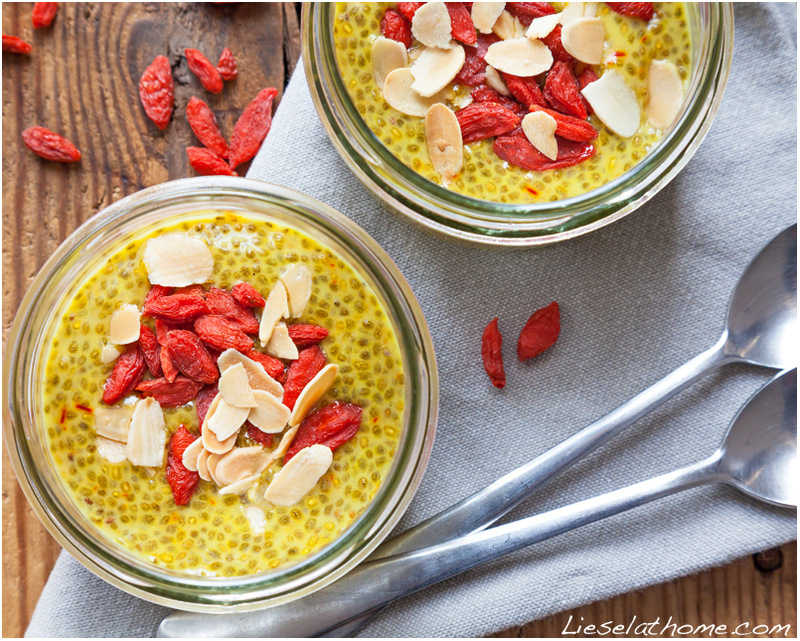 And here served at room temperature in glass jars (that has lids), topped with goji berries and almond. Also lovely and perfect for a bring along snack if you just place a lid on the jar and pack a spoon. Raisins would work too and so would other nuts of course. Added later : I realized I would not be making this pudding too often thinking of the price of saffron here, so I thought of a way to keep the “oriental” touch and save on saffron. Made a version with just a touch of saffron, keeping the cardamon, and adding turmeric (the yellow in curry also called Curcuma/Kurkuma or “gurkmeja” in Swedish) and just a pinch of cinnamon. You have to add the spices and taste to get the right amounts. Tasted lovely with a few nuts and dried fruit! Less colorful – but the same warm spicy taste!